AMMAN — His Majesty King Abdullah, accompanied by His Royal Highness Crown Prince Al Hussein Bin Abdullah II, on Tuesday attended a celebration at Al Hussein Cultural Centre in downtown Amman, held by churches in Jordan on the occasions of Christmas and the New Year. 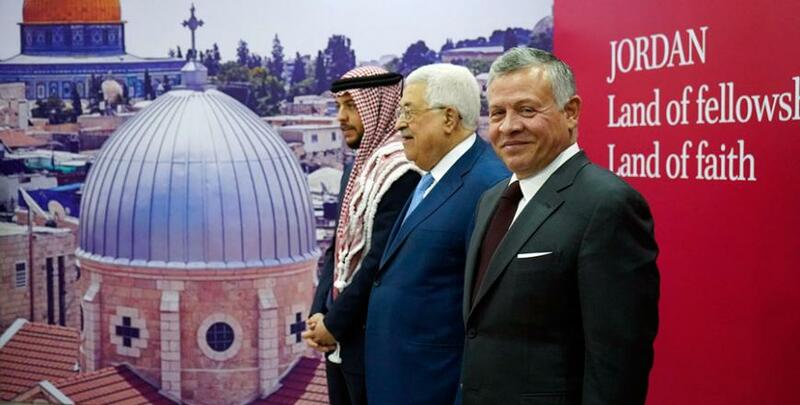 Palestinian President Mahmoud Abbas, church leaders from Jordan and Jerusalem and representatives of the Jerusalem awqaf, attended the celebration, organised by the Council of Church Leaders in Jordan. King Abdullah extended his best wishes to Jordanians, Palestinians and all Arab Christians on this occasion. During the ceremony, representatives of the Jerusalem churches and awqaf delivered remarks that highlighted Christmas as an occasion to celebrate peace and love, and an opportunity to promote the importance of living in harmony. They reiterated that Jordan, under the leadership of His Majesty, will remain steadfast in defending Jerusalem and its holy sites, stressing the importance of the Hashemite Custodianship of Islamic and Christian holy sites in Jerusalem as a continuation of the Pact of Omar. They stressed that there is no alternative to the two-state solution to achieve peace, in which East Jerusalem is the capital of the State of Palestine. They expressed appreciation for the King’s donation of a large part of the Templeton Prize, received by His Majesty last month, for the restoration of the Church of the Holy Sepulchre. The speakers also commended the King’s efforts that resulted in a set of UNESCO resolutions supporting the inalienable rights of the Palestinian people to Al Aqsa Mosque and Jerusalem. The celebration, which is held under the theme “Jordan Land of Faith and Fellowship”, continues through December 19 at Al Hussein Cultural Centre and includes performances by the Fountain of Love Choir, the National Music Conservatory Orchestra and a number of performers. Royal Hashemite Court Chief Yousef Issawi, Adviser to His Majesty and Director of the Office of His Majesty Manar Dabbas, Chief Islamic Justice Abdul Karim Khasawneh, Grand Mufti Mohammad Khalaileh and a number of senior officials and Christian and Muslim leaders in Jordan and Palestine attended Tuesday’s celebration. I have the great honour to present the speech of His Beatitude Theophilos III, Patriarch of the Holy City and all other works of Palestine and Jordan, and convey to Your Majesty the greetings of the members of the Holy Synod, the members of the Holy Sepulchre, the honoured priests of the Greek Orthodox Patriarchate of Jerusalem and our children, the faithful of the Greek Orthodox Church, in the celebration of this glorious Christmas under the patronage of Your Majesty. For You, Your Majesty, the King of the beloved Jordan, are the Custodian of the Islamic and Christian holy sites in Jerusalem, including the Holy Sepulchre and the Greek Orthodox Patriarchate of Jerusalem. This Custodianship that forms a shield of protection and an extension to the Omary Covenant that took place between the Patriarch Sophronius and Caliph Omar Ibn Al Khattab. We are keeping this covenant with you until God inherits the earth. Christmas is the day of the incarnation of peace and love. This love is the fruit of divine descent mixed with self-sacrifice, utter humility and self-relinquishment, in order for man to reconcile with God and his neighbour. This overwhelming peace descends from above, the heavens, and dwells in the heart of man. For there is no peace on Earth without the peace and purity of the heart. We cannot love God without offering this love to our neighbour. For man has to love his fellow man, whoever he may be and from wherever he may be. The glorious Christmas teaches us to see God in the face of every man on earth and to love him. That is why Christ was born in the flesh, from a virgin woman (Our Lady the Virgin Mary), and has chosen to be born in a manger, in a modest cave, in the small city of Bethlehem. The first who heard the praise of the angels from heaven, the missionaries of His birth, were the simple shepherds of Beit Sahour. Those who gave Him gifts were the wise men who were strangers, and the first who defended Him were the children martyrs of Bethlehem. With the birth of Jesus in our Holy Land and His baptism in the Jordan River, we have here in Jordan a new birth for all mankind. This birth founded universal spiritual concepts that changed the course of history henceforth forever. Today, as we celebrate with you this glorious Christmas that reminds us of the importance of peace and the urgent need of human societies to it. We appeal to all those of good will throughout the world to work for the just peace of all people, to solidify the brotherhood of people and their living together. We welcome others, especially the needy. We open up to them in the spirit of love. We listen to them, accept them and extend a helping hand to them to contribute to the spirit of brotherhood and love, not to the spirit of isolation. Our celebration of the glorious birth is measured by our ability to love, receive and be in unity. Our Orthodox church, the Mother of Churches, is the local church in our Holy Land and is represented by the Greek Orthodox Patriarchate. This is deep-rooted by the Church canons and even by international laws. Hence, out of our spiritual and pastoral responsibility in the body of the universal Church, we raise the warning flags of the dangers that result from the heretic teachings and positions of certain groups that speak in the name of Christianity. Where true Christianity is free and innocent from these teachings. These groups, especially the Christian Zionists, adopt beliefs and teachings that could not be farther from Christ and his teachings. These pseudo-Christians run on interfaith platforms and give a distorted picture of our Christian faith. They exploit interfaith forums to falsify history. In our Orthodox Church, we warn against the distortion of true beliefs in order to achieve the goals of those who hate and conspire. Our Church indeed suffers from attacks on its properties and endowments in Jerusalem and Palestine as a part of a systematic attack on all the churches of Jerusalem. These attacks take several forms: from imposing taxes to trying to confiscate property, to forcing our children to study the Israeli curricula. In fact, more than fifty churches have been burned and broken by the so-called Jewish price-tag groups since 1967. Unfortunately, the campaign of targeting churches is continuous till today. This requires the mounting of efforts from all the churches of the world to support the Custodianship of Your Majesty to protect the Holy Sepulchre, holy sites, and our historic churches in the Holy Land. We and all the Churches of the Middle East have expressed our firm position that the basis of peace in Jerusalem is for the Church of the Holy Sepulchre to remain for Christians only, as is the Al Aqsa Mosque for Muslims alone. We would also like to emphasise, on behalf of all the Churches of the Holy Land, that there is no alternative to the two-state solution, and that East Jerusalem is the capital of the State of Palestine. These are the most basic rights of the oppressed Palestinian people. If the world continues to ignore them, we will witness more religious conflict, extremism and aggression against the rights of others. In this difficult time of wars and tragedies that occur in the neighbouring countries, and in the midst of daily human suffering and the growing fear of the unknown in the hearts of people. We had beautiful overwhelming feelings of trust, love and hope when you received the Templeton Prize for harmony and peace. This added to our pride and love for Your Majesty. Your authentic Hashemite generosity was your response to this prize. When out of your reverence to the holy sites, Your Majesty donated a large part of this prize to renovate the Church of the Holy Sepulchre. Your stand showed the whole world the true image of Islam and a unique model of coexistence. Your majesty also exhibited the determination of a great leader to preserve the national fabric of his kingdom. Your Majesty, the performance of your duties in your stewardship and guardianship of our Islamic and Christian holy sites is the best example to the world of true jihad, and is a lesson to each one how he should do his best in his duty. As we are approaching Christmas and the beginning of a new year, with all the joy this brings to our souls, allow me to start by thanking the Lord for all his blessings and to continue praying for the nation’s prosperity and well-being. The Gospel says that the angels of the Lord stood before some shepherds, and the glory of the Lord shone around them bringing them the good news, a great joy that will be for all the people: the birth of a Saviour (Lk 2:10). And the shepherds said to each other: “Let us go to Bethlehem and see this thing that has happened, which the Lord has made known to us.” (Lk 2:15). Like the shepherds, we too want to go again to Bethlehem to see, as every year, the miracle, the promise that was fulfilled when the Lord became one of us. And we will see each other shortly in Bethlehem. We go to Bethlehem to present our hopes and our fears to the Word of God, to implore his mercy, to have the joyful spirit of this season in our hearts and souls. Despite all the hard times the region and the world are enduring, we are determined not to renounce the joy of these days. We do not want to turn off the lights of the Christmas trees and the music of our festivals that adorn our streets and out theatres. On contrary, we want to express like the shepherds our joy. In Jordan, we all get to enjoy several blessings: the beauty of religious coexistence and fruitful dialogues that bring all the communities even closer to each other. The blessings of living the spirit of the Amman Message, that of religious moderation, inclusion and respect. The blessings that we, in Jordan, under the patronage of Your Majesty, are one family and that this Country, even if small in size, is a cornerstone to the stability of the region. But we also want to be vigilant and attentive, because there are also reasons for apprehension for us and for our Churches. In fact, this year as well, we have had to struggle with many problems and raise many concerns that are endangering the stability of our communities, particularly in Jerusalem. These Christian communities may be small in numbers, but very vibrant and dedicated, in serving the Community through their schools, hospitals and many other similar institutions. This is the Christian way of contributing and being partners, side by side, with their fellow citizens, to serve the nation and preserve the identity and the universal value of Jerusalem as a holy city for the three Abrahamic religions, as the Pope Francis stressed on many occasions. Unfortunately, in the last few months, we have had to raise our voices several times to guarantee the right freedom and respect for our institutions, even with extreme initiatives, such as the closing of the Holy Sepulchre. Indeed, the Churches have more than once been at the centre of local political struggles and exposed to the threat of unilateral taxation initiatives that have put the survival of their respective social and charitable activities at a great risk. On another hand, the political instability of the region, especially in Syria and Iraq, the constantly changing regional and international political equilibrium, accompanied by a serious economic recession, confuse our people in Jordan and increase their fears. At times, tensions within our respective religious communities, caused even by a simple depiction and amplified by social media, could easily arise, as it happened. And it is therefore even more necessary that we all work together—as we did—to keep the social and religious balance of our society always stable and strong. On this occasion, we turn to you and to the Hashemite family, which has always been not only the guardian of the Holy Places, but also the guarantor of social and religious peace in Jordan and Palestine. Once again, we are here to support your efforts to ensure that the voices of your people, Christians and Muslims, are heard in all institutional, regional and international forums, so that the delicate balance of the holy city is preserved, the voices of the poor of the Holy Land find acceptance and for justice and truth to be supported. In this occasion I want to congratulate Your Majesty for the Templeton Prize you received recently, as a sign of appreciation for what you do in promoting dialogue and respect in your country and in the international community. As a religious Pastor, I also commend your decision to give a general amnesty for several prisoners in your country, as sign of reconciliation in the nation. This is the occasion also to thank the Royal House for the continuous support in giving to the various and everyday needs of the Churches, through the offices of Prince Ghazi. May the Lord bless all of us and our efforts in building a better society, and the Lord who decided to dwell in Bethlehem, continue to dwell in our communities, in our houses and in our hearts as well. Prayers and peace be upon the Arab Hashemite Prophet, who was taken on a journey by night from the Grand Mosque to Al Aqsa Mosque, where he prayed, as imam of all prophets of Allah and from where he ascended to the heavens above. Allah says: “Say (O Muslims): We believe in Allah and that which is revealed unto us and that which was revealed unto Abraham, and Ishmael, and Isaac, and Jacob, and the tribes, and that which Moses and Jesus received, and that which the prophets received from their Lord. We make no distinction between any of them, and unto Him we have surrendered.” Al Baqarah 136. A few days ago, we, along with Muslims across the world, celebrated the birthday of Prophet Mohammad, peace and blessings be upon him, and these days, Christians are celebrating the birthday of our Prophet Jesus, peace be upon him. I take this opportunity to extend my warmest wishes to all our Christian brothers and sisters. All of us, Muslims and Christians, have lived side by side in the Holy Land. We shared life’s good and bad moments, basing our coexistence on the 1,400-year-old Pact of Omar, a pact based on the teachings of Prophet Mohammad that compels Muslims to protect the Church of the Holy Sepulchre and preserve it exclusively for Christians, just as we and our Christian brethren defend Al Aqsa Mosque to preserve it solely for Muslims. This principle is the cornerstone of justice and peace. Attempts to seek the division, occupation or sharing of the mosque are rejected aggressions that will only bring hatred and religious war. We come, Your Majesty, from Jerusalem, from Al Aqsa Mosque/Al Haram Al Sharif, to Jordan—the frontline state in this struggle—carrying the suffering and grievances of the Jerusalemites, who have persevered in patience and constancy, resisting the Israeli occupation for over fifty years and continuing to fight in defence of their holy sites, never caving in. We, Jerusalemites, Muslims and Christians, are in a constant daily struggle to overcome the Israeli occupation authorities’ enforced claims of sovereignty over the Holy City through the threat of arms. They have surrounded the city with an Apartheid wall to separate it from the rest of Palestine, and with settlement blocs within and outside Jerusalem. They are seizing property by fraud, and forcing Arab Jerusalemites to study Judaised school curricula while Judaising street names. They are excavating and tunnelling under the walls of Al Aqsa Mosque. This is all besides the daily incursions by Israeli forces, Jewish extremists and terrorist groups into Al Aqsa Mosque, the most recent of which included incursions into the Dome of the Rock Mosque, and attempts to practise Talmudic rites at the eastern wall of Al Aqsa Mosque, at the historical Bab ar-Rahma cemetery, the final resting place of some of the companions of Prophet Mohammad, as well as scholars, philanthropists, and the martyrs of your Jordanian Arab Legion, who sacrificed their lives to protect Jerusalem’s land and the walls of Al Aqsa Mosque. These aggressions threaten Al Aqsa Mosque like never before and reflect the systematic aggressive policies of an extremist right-wing government supported by international Zionism and the Zionist evangelical movement. Israel wants to transform an issue of occupation into a religious conflict to impose an interfaith dialogue promoted by Zionist entities and others. Our position is clear: interfaith dialogue on Jerusalem and Palestine with the occupiers is an unacceptable red line that is only embraced by those who accept the occupation. The laws and rulings issued by Israel’s Knesset and courts and which Israel is trying to impose on Al Aqsa Mosque are null and void, and they will never grant it any rights to the Mosque and to Jerusalem. We reaffirm that the Jordanian Islamic Awqaf Directorate, working under Your Majesty’s Hashemite Custodianship is the exclusive party with the mandate to administer, preserve and restore the holy site. We assure you that we will continue to uphold the responsibility of protecting Al Aqsa Mosque as long as there is life in our bodies. And we are committed to the Hashemite Custodianship of Al Aqsa Mosque and holy sites. We highly value Your Majesty’s sincere international efforts to defend Jerusalem, in coordination with the State of Palestine, which have resulted in a number of UNESCO resolutions supporting our inalienable rights to Al Aqsa Mosque and Jerusalem. With Israel continuing to disregard these resolutions, local and international efforts must be stepped up to counter this aggression by coming together to safeguard and pray at Al Aqsa Mosque, and by encouraging Muslims from around the world to visit it to increase the number of worshippers. We are hopeful that Your Majesty will lead an Arab Muslim effort to safeguard Al Aqsa Mosque and support its cause, the noblest and holiest of causes, going beyond statements of condemnation to effectively support the perseverance of Jerusalemites on the ground. We call on Your Majesty to continue calling for reaching out to Jerusalemites and to continue to urge all to visit Jerusalem, pray at Al Aqsa Mosque, and visit the Church of the Holy Sepulchre to stand in the face of Israeli threats and fabrication of the city’s history and denial of the Palestinian people’s rights to establishing their state on their land, with Jerusalem as its capital. Jordan will remain the sturdy line of defence for Jerusalem and its holy sites. May Allah protect Your Majesty and keep Jordan an oasis of security and stability.